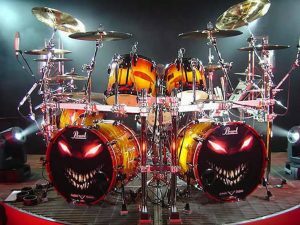 Since it’s Halloween today, here are some thoughts on masquerading as other drummers. If you’re an experienced drummer, you probably have mimicked other drummers whose playing inspired you. If you’re not, consider doing so. Musicians “steal” from other musicians this way all the time. It’s perfectly legal, and a great way to learn new things and get new vocabulary. Just this week, in a new project I’ve been playing in, it occurred to me that playing like Pete Thomas, best known as the long time drummer for Elvis Costello, would be the exact right vibe for some of the band’s music. So, I revisited some of those early EC albums to re-acquaint myself with Thomas’ drumming. BAM! Instant vocabulary reminder. I recall hearing a story about the great drummer Tony Williams, who dissected the drumming of his idols in detail. The story comes second-hand from one of the members of Tony’s ’90’s era Blue Note groups. In a rehearsal with his band one day, Tony talked about how he was influenced by Max Roach, Roy Haynes, Buddy Rich, Philly Joe Jones, Papa Joe Jones, etc…. and then after he uttered each name, he played a solo in the style of that drummer. Not surprisingly, he sounded exactly like each drummer he named. On command, he could play like any of his favorites. Williams, of course, took all his influences and morphed them into his very own unique sound. But the point is that he studied the drummers he loved for vocabulary and ideas. So, in the spirit of Halloween, try wearing the mask of a different drummer.